I’ve been in England for the last two weeks, and by far the most talked-about photographs are the blurry cellphone snaps of Prince Harry cavorting naked in Las Vegas with some young women during a game of strip billiards. TMZ first published these a week ago, and the British media has been pushing the story relentlessly ever since. The reaction to these photos has been interesting. I’m bemused by my home country’s continuing love for Harry despite yet more evidence of his poor judgment (remember the time he wore Nazi regalia to a costume party?) And I’m fascinated by the restraint of the British press, which—with one exception—has so far refused to print the images. This has something to do with Britain’s strict privacy laws and possibly more to do with the Leveson Inquiry, a pending investigation of press conduct in the wake of the Murdoch phone-hacking scandal. It seems the press doesn’t dare get on the wrong side of Lord Justice Leveson right now, so it’s being careful… a rare case of restraint in today’s media world. But I’m not going to dwell on this, because there are far more significant things going on in the world of British photography. 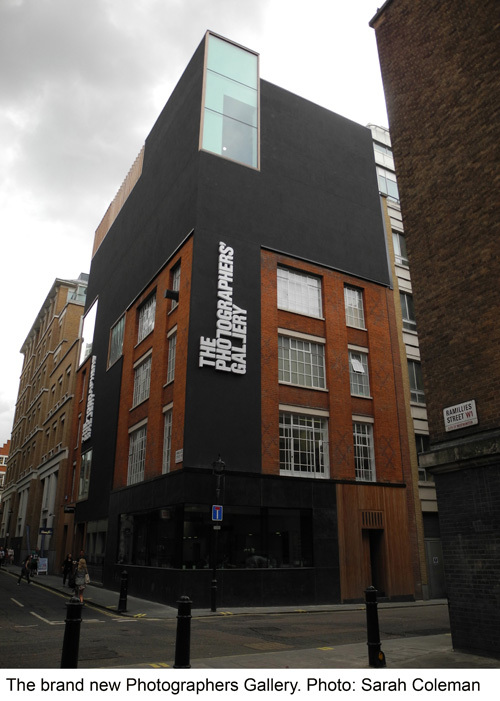 I was delighted, for example, to see that the Photographers Gallery has moved into a brand new building on Ramillies Street, just off Oxford Street. The purpose-built gallery is just three months old and at least twice as big as the old one. When I visited, the galleries were showing finalists from the Deutsche Börse Photography Prize, which included Pieter Hugo‘s Permanent Error, a powerful project on slum dwellers who scavenge technological waste in a vast dump on the outskirts of Accra, Ghana. There was also interesting work by John Stezaker, who uses found images to make minimalist but effective collages that become wry comments on the human condition. Half a mile down Oxford Street, the Photographers Gallery has also mounted a public art installation on the walls of an office building opposite the famed Selfridge’s department store. 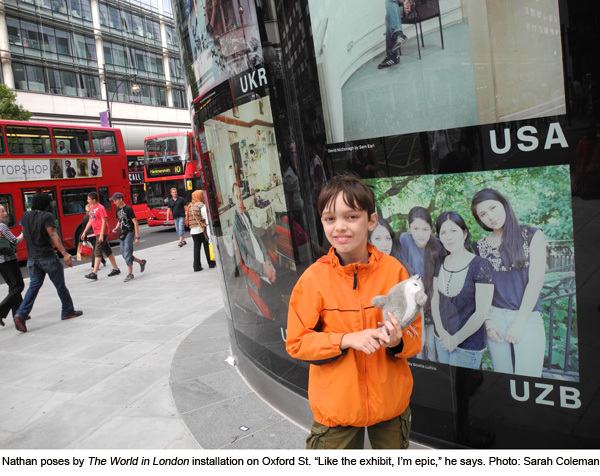 Titled The World in London, the installation features 204 portraits of Londoners by 204 different photographers. 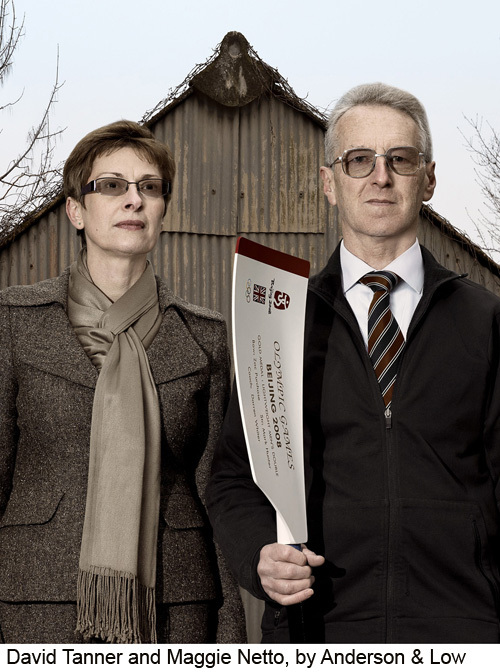 In honor of the 2012 London Olympics, each Londoner portrayed in the series comes from a different competing nation. It’s hard to imagine anything more diverse—not only the faces, but the photographic styles are widely divergent. I loved looking at this series, which is viewable on a great interactive web site here. Even my dragged-along 10-year-old son had a great time comparing the images and trying to figure out the three-letter codes for each nation. The Olympics had just finished when we arrived, and it was great to see how the Games-generated national pride was persisting. The Union Jack was everywhere, along with the jagged Olympics logo and one-eyed Olympic mascots Wenlock and Mandeville. Most conspicuously, people everywhere seemed to be in a good and generous mood, which turns the national image on its head a bit. I guess that’s also why there was no outcry, just tolerant amusement over Prince Harry’s high jinks (though that might be changing). Not surprisingly, London’s museums were capitalizing on the city’s Olympic moment. At the National Portrait Gallery, four photographers had been commissioned to document Britain’s involvement in the Games in various ways. I liked Jillian Edelstein’s portrait of people behind the scenes at the Olympics, including chefs Gerard O’Sullivan and George Whitelock, and Anderson & Low’s portrait of rowing dignitaries David Tanner and Maggie Netto—yet another witty take on Grant Wood’s American Gothic—but my favorite among these projects was Nadav Kander’s series Torch Bearers, portraits of ordinary citizens who’d been nominated by someone they know to be Olympic torch-bearers. 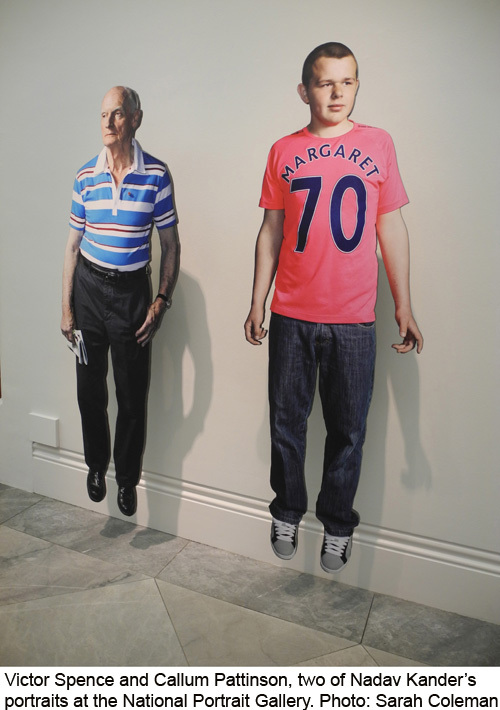 Cut out like paper dolls and mounted on thick board, these life-size images could have been mistaken for real people, except that they were floating six inches off the floor—a recognition of the altruistic acts that had inspired others to nominate them. I’d never seen anything quite like this before, and it worked brilliantly, especially alongside Kander’s elegant but more conventional black-and-white portraits of young British athletes. 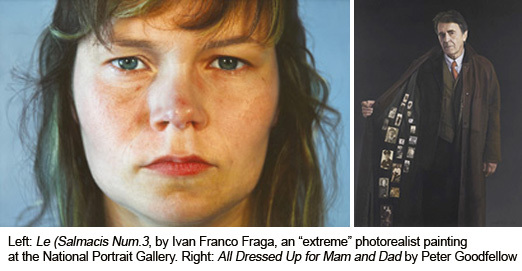 While at the NPG, I dipped into the BP Portrait Award 2012, and was interested to note that almost half of the chosen paintings were ultra-photorealistic in a way that even surpassed original photorealists Richard Estes and Chuck Close. This felt like a wheel coming full circle—as if, having exhausted alternatives, painters have now returned to photorealism and upped the technical challenges a bit (some of these paintings were totally indistinguishable from photographs).You can’t help but marvel at the sheer technical prowess, though I generally preferred the more out-of-the-box and expressive pieces in the show. And I especially loved this self-portrait by Peter Goodfellow in which he collaged old photographs of his parents to the inside of his coat, as a visual metaphor for how he carries them with him always. The show that wowed me the most, however, was Another London at the Tate Britain. 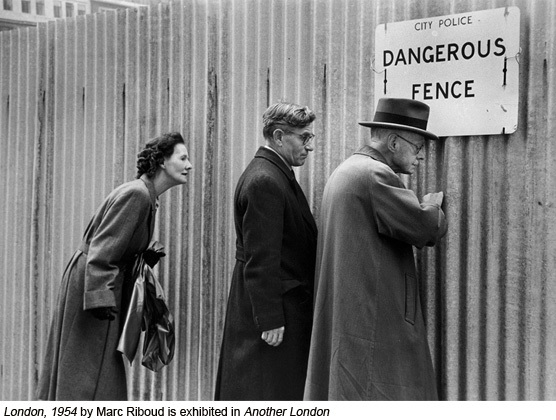 The forty-one photographers featured in the show are all non-Brits who photographed in London between 1930 and 1980. Images by famous names like Henri Cartier-Bresson and Bruce Davidson hang side-by-side with stunning work by lesser-known names like René Groebli and Wolfgang Suschitzky. There are stereotypes depicted here—double-decker buses emerging from smog, the “stiff-lipped men in bowler hats and cheeky cockneys with their thumbs in their waistcoats and fish on their heads” who, according to snarky Brit writer A.A. Gill, disappeared long ago. 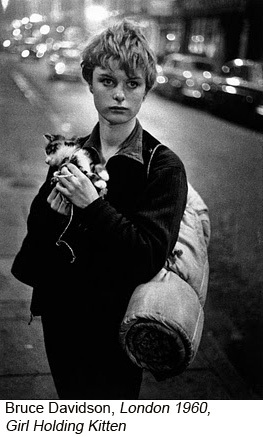 But there are also delightful surprises, like Al Vandenberg’s joyous 1975 portrait of an interracial couple, or this haunting 1960 Bruce Davidson portrait of a London gamine holding a kitten. What advantage does an outsider bring to depicting a nation? I’ve recently been reading Jonah Lehrer’s book Imagine, which—despite having been widely discredited after Lehrer was caught fabricating Bob Dylan quotes—has some interesting things to say about creativity. Photographers are by nature outsiders. Whether it’s this, or just that the ones in Another London are world-class artists working at the top of their game, the exhibition is a delight. Even when stereotypical Londoners are depicted, they’re seen so carefully that they become more than types. But there’s something else here too—a place full of social tensions and messy contradictions, an old order being gradually redefined by new waves of immigrants and ideas. In another words, the essence of a modern city. 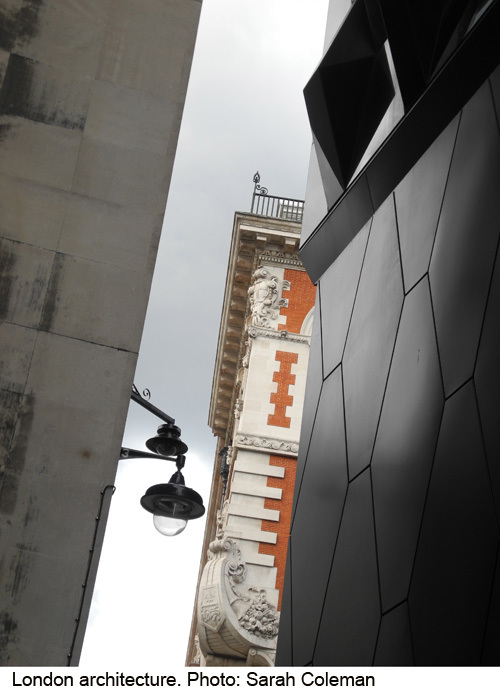 Browse and/or contribute to the Twitpic gallery for Another London here. Sarah, I don’t know how you do it all so fast. You certainly crammed a lot into a short time, and clearly have a great eye and the ability to pick out the important themes. Nice to see some of your own photos, and your own son in one. You are an excellent critic and journalist. I am inspired to go to the NPG if I get out with Devra on Wednesday, as we hope to lunch at the O & C club, and could walk up there afterwards. Hope all is going well in Lyme Regis. Just looked at the weather forecast for LR. Tomorrow looks OK, but some rain on Wed & Thurs, and better on Friday. P.S. I’ll try calling you this evening. Thank you my biggest fan! Yes, I really want to see that show. I expect there will be some crossover with ‘Another London,’ but will be interesting to compare. London is certainly having its moment in the spotlight! 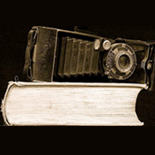 This entry was posted on August 27, 2012 by sarahjcoleman in Books, Exhibitions, Uncategorized and tagged Another London, Bob Dylan, BP Portrait Award 2012, Bruce Davidson, Chuck Close, Imagine, Ivan Franco Fraga, John Stezaker, Jonah Lehrer, Leveson Inquiry, London, National Portrait Gallery, Olympics, Pieter Hugo, Prince Harry, Richard Estes, Tate Britain, The Photographers Gallery, The World in London.